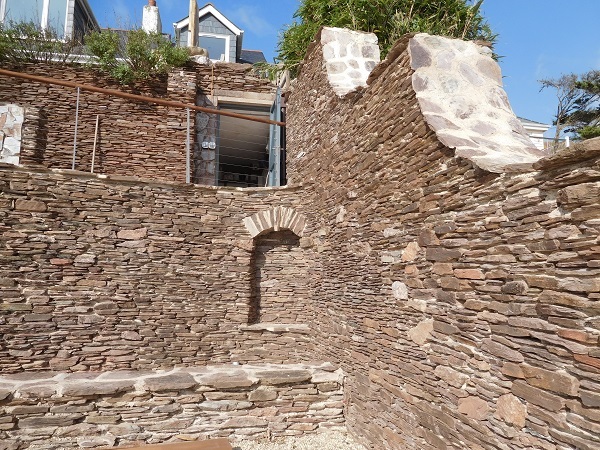 Folly Hill ~ Bigbury on Sea, Devon. 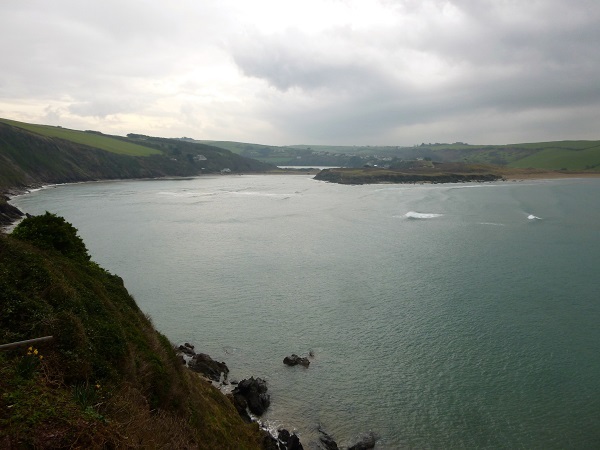 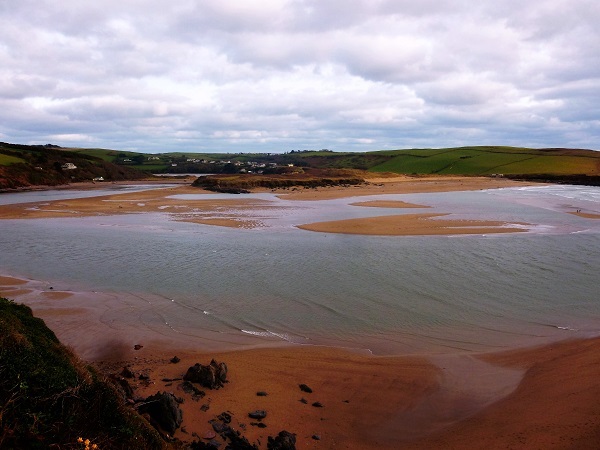 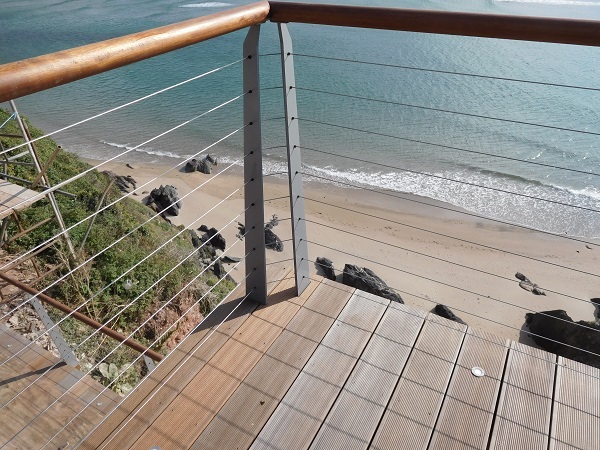 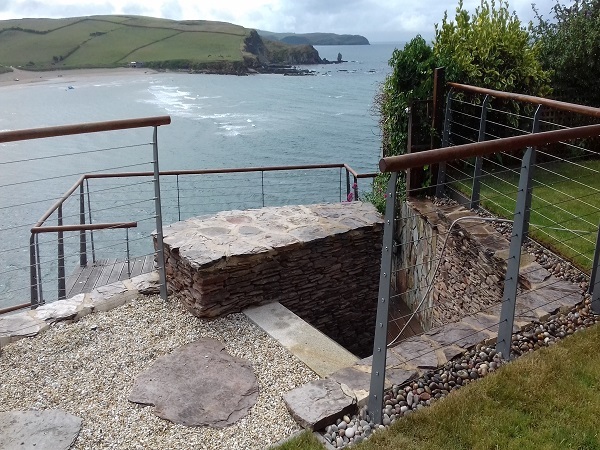 This place is situated high up on the cliffs in Bigbury on Sea, Devon, with stunning views towards Bantham. 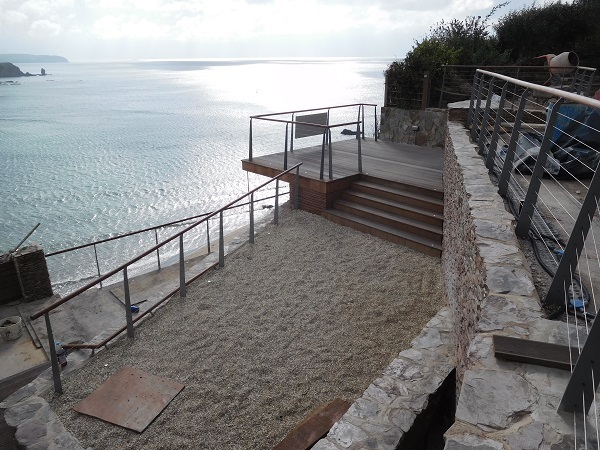 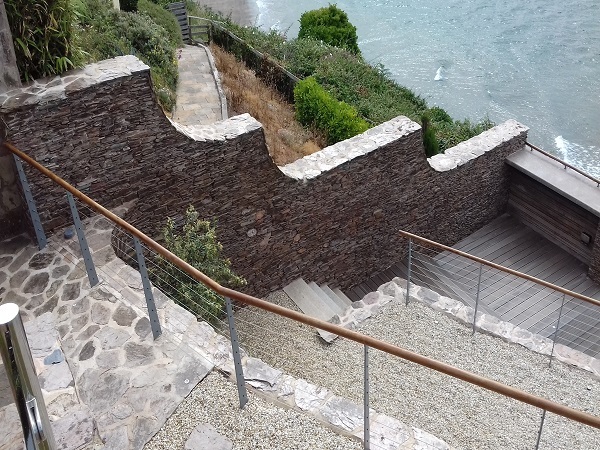 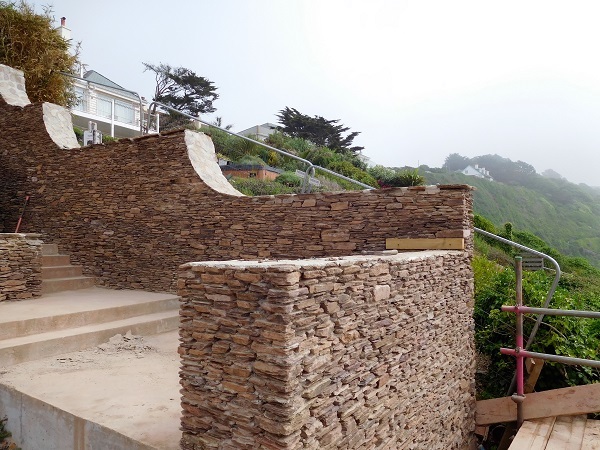 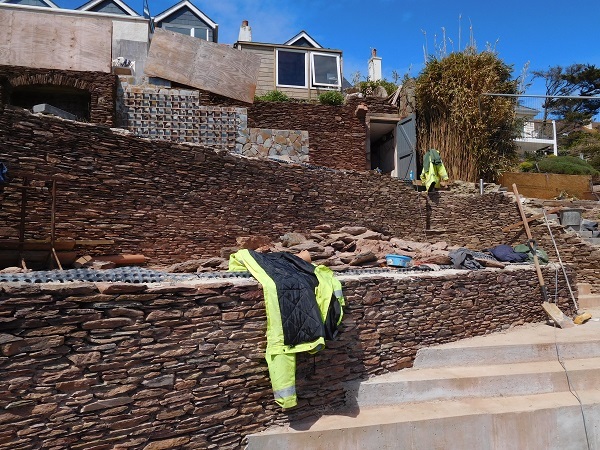 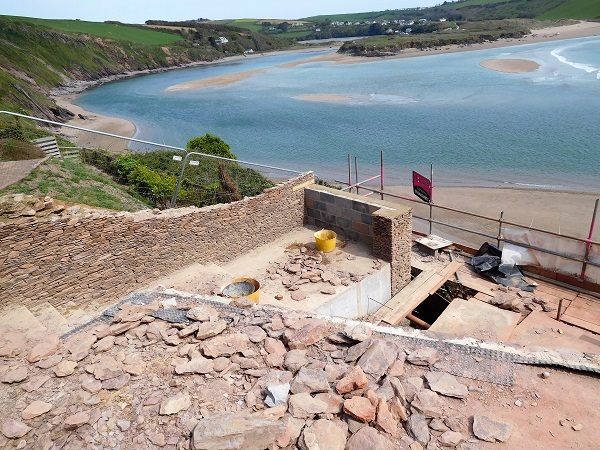 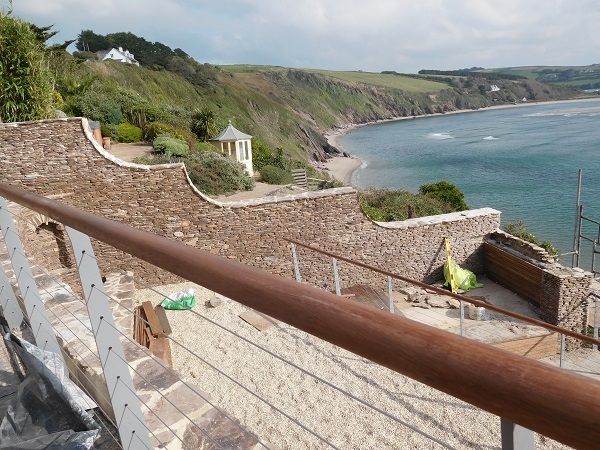 Due to coastal erosion, a substantial section of the cliff had collapsed at the rear of the property and the whole back garden ended up on the beach, a hundred feet below, leaving the property just a few metres away from the edge. 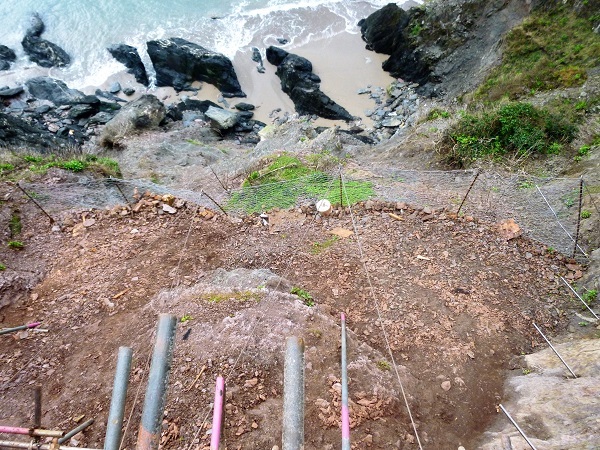 Engineers came in, surveyed the damaged, and instructed specialist contractors to stabilize the cliff. 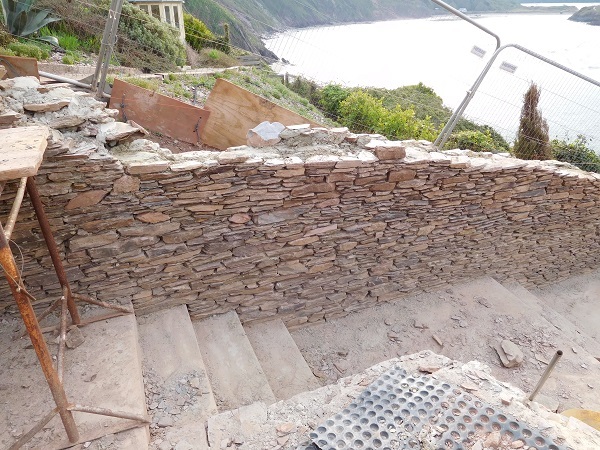 This was done by drilling deep into the remaining cliff face and grouting in thick steel bars. 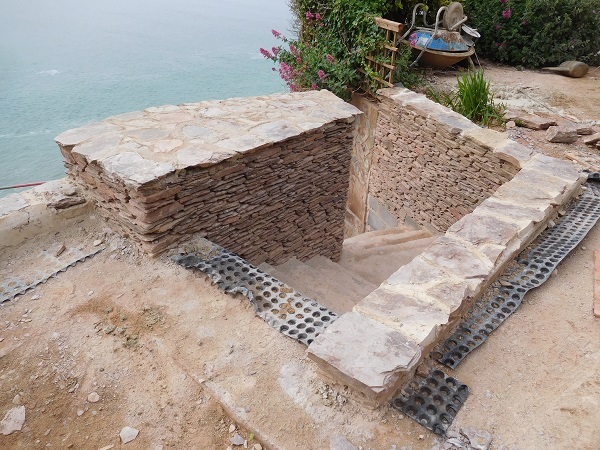 More than fifty bars were eventually drilled and fixed with steel plates bolted on the ends. 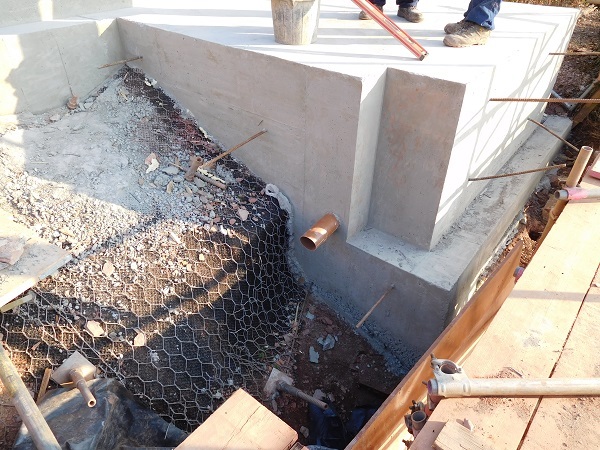 Once the stabilization work had been completed, formwork was constructed and tons and tons of marine grade reinforced concrete was laid for foundations and retaining walls over five levels. 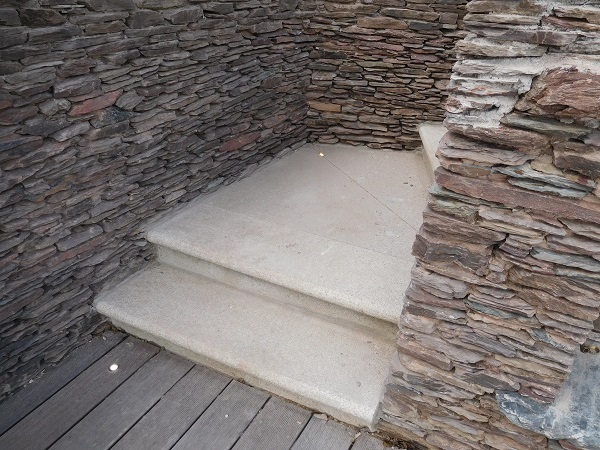 K & J Construction based in Ashburton were the main contractors overseeing the work and it was at this stage of the project that they had asked us to construct all the stonework for the garden. 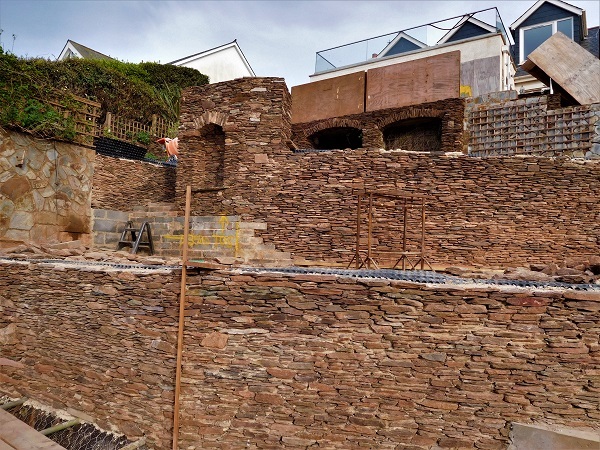 This mainly involved facing off all the newly formed concrete retaining walls with stone and the rebuilding of a large boundary wall. 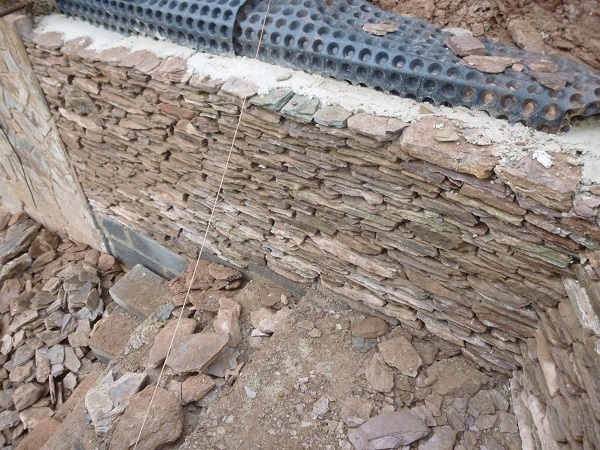 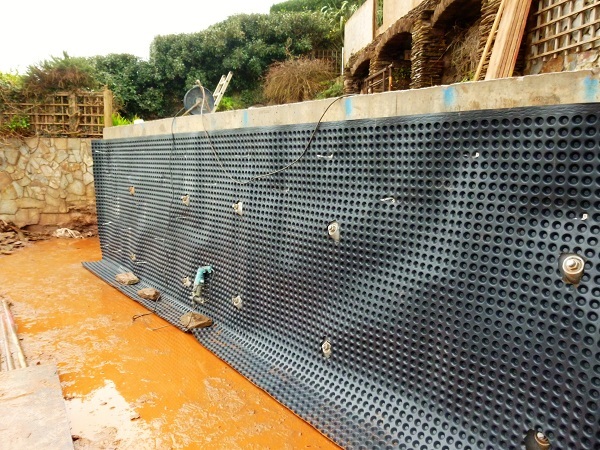 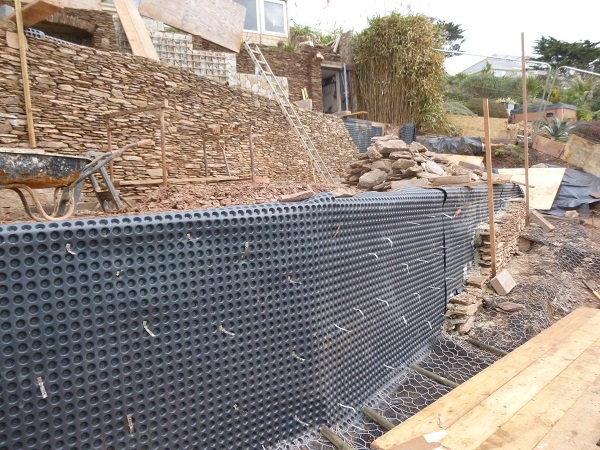 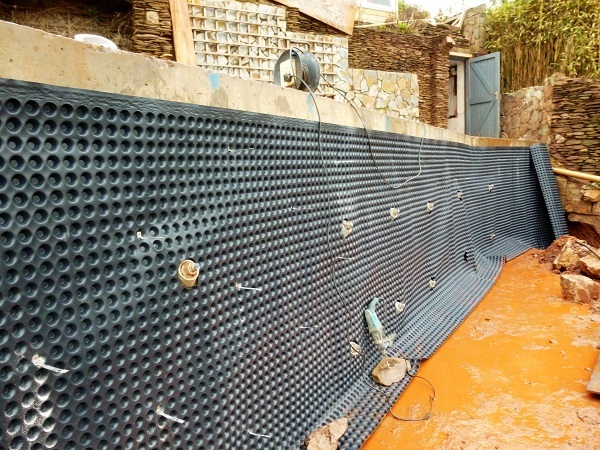 Before any stonework could be built, a damp proof membrane had to be fixed to the concrete along with wall ties. 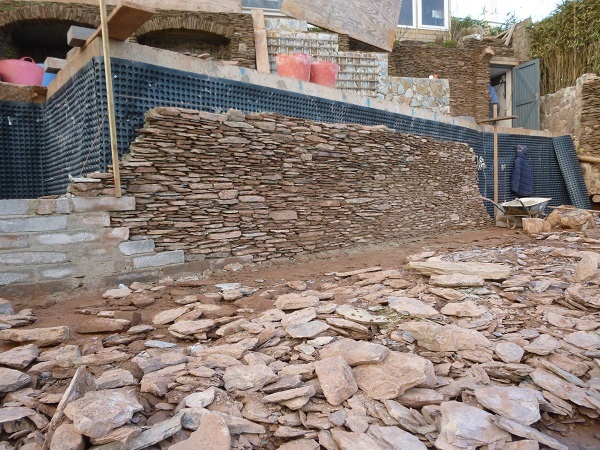 We started on the wall to the top terrace first. 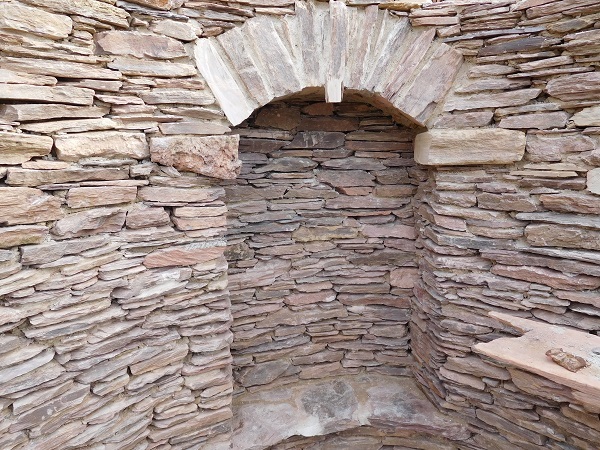 A local farmer supplied the stone which was dug out of one of his fields. 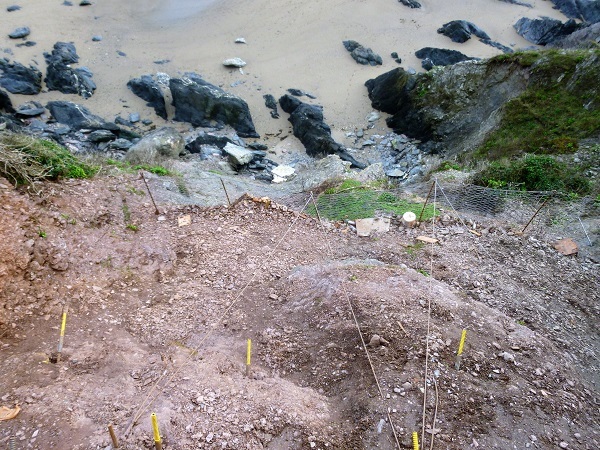 It consisted mainly of small, thin pieces of shale which was a reddish-purple in colour. 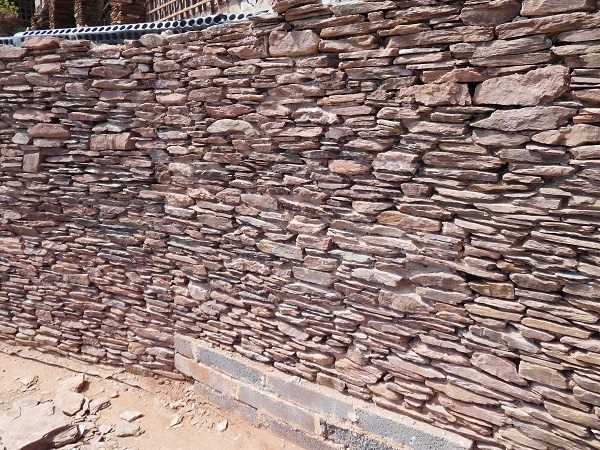 There were already stonewalls around the property that had not been affected by the landslide, and this is what we had to replicate. 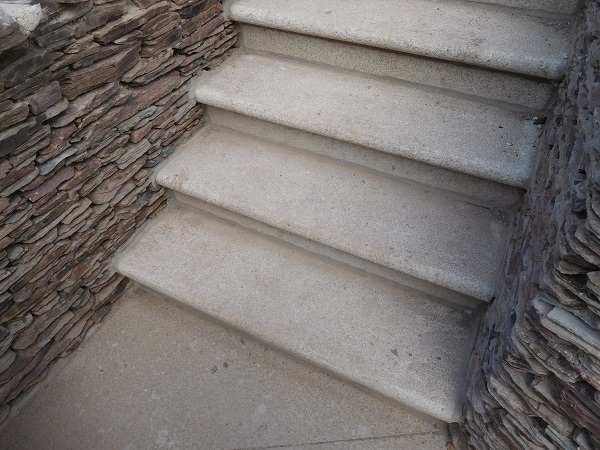 This type of stone is used quite extensively around these parts and due to its size it is time consuming to lay. 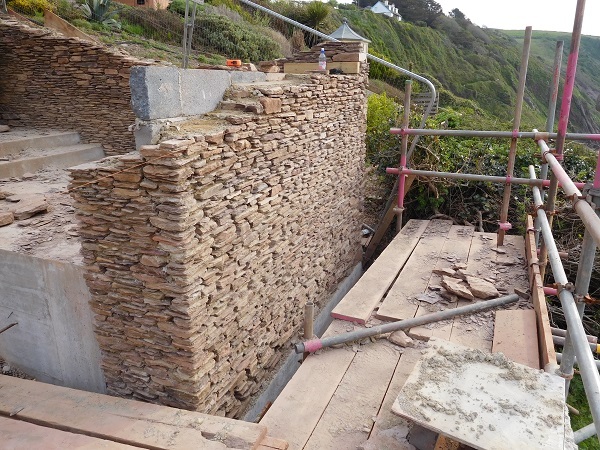 The stone was delivered to site and we could now begin work on the walls. 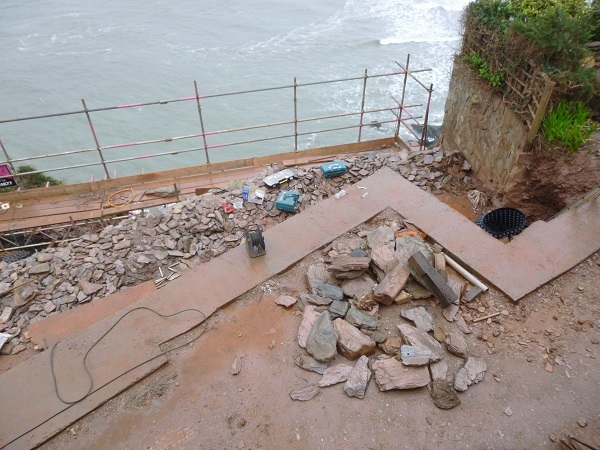 The corner here would eventually sweep around and tie into the new boundary wall which was going to be built between the two properties. 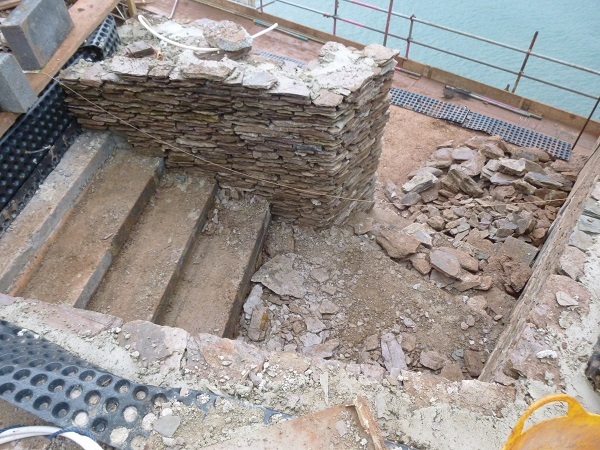 We had to set out a flight of steps from the top terrace down to the next and this was built with a solid core of blockwork. 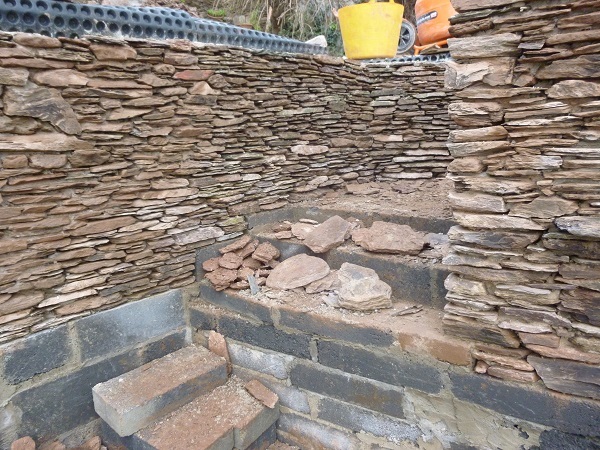 None of the blockwork would be seen. 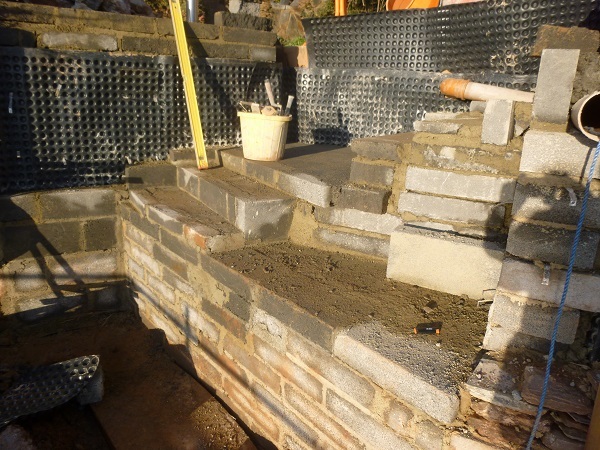 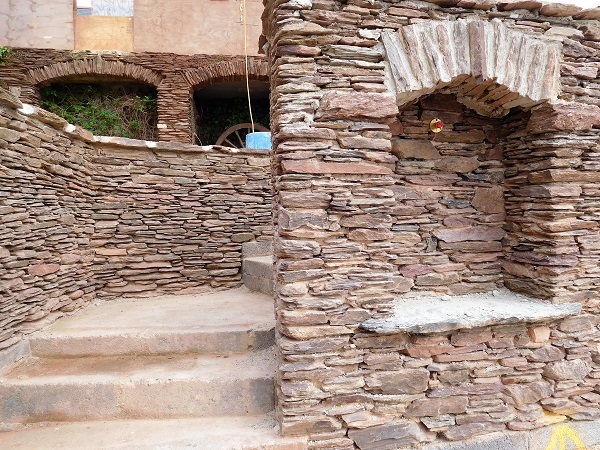 As soon as most of the blockwork had been placed the stonework to the sides of the steps were built. 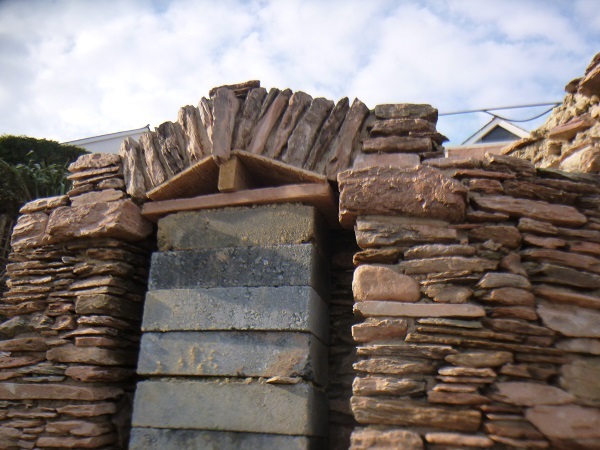 In the wall next to the steps a niche with an arched top and slate sill was created and this was eventually going to house a garden tap. 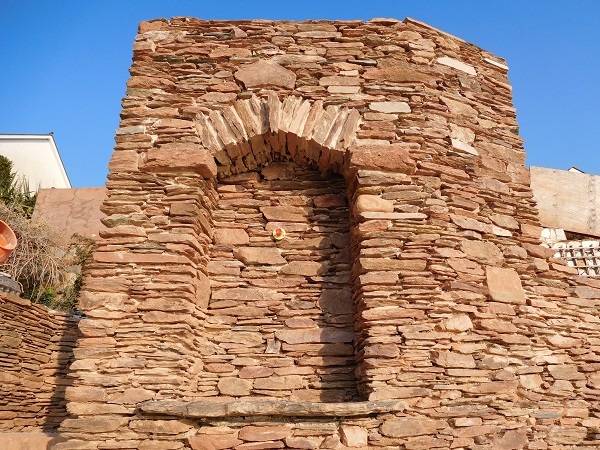 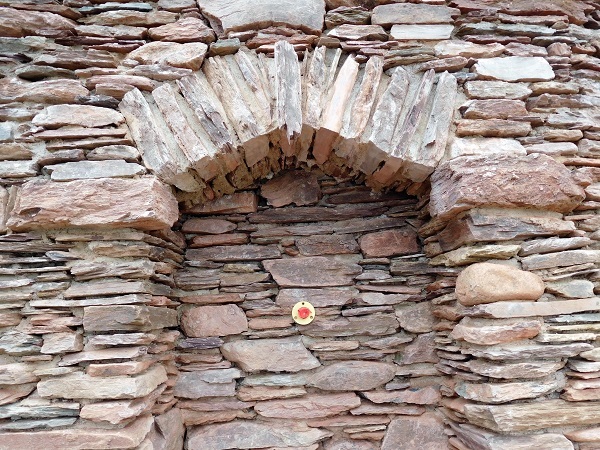 All the stonework was constructed using a natural lime mortar. 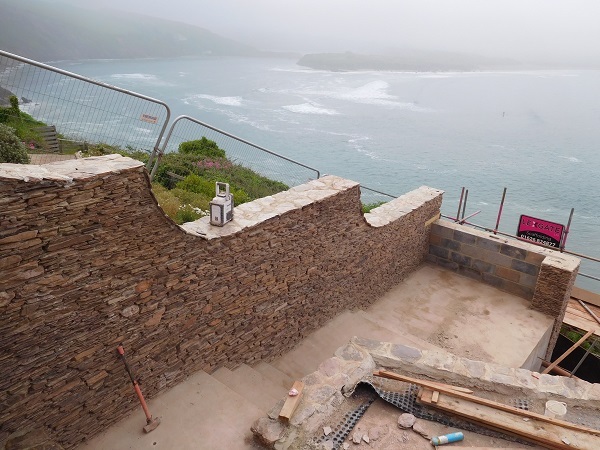 When the stonework to the upper terrace had been almost completed, it was time to start on the walls at the lower levels. 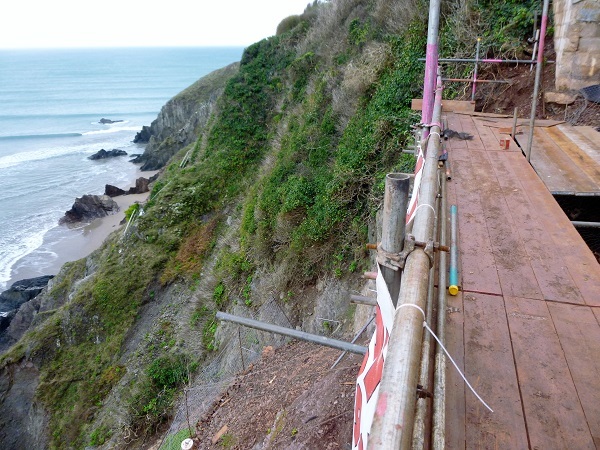 The scaffolding here was literally right on the edge of the cliff, and once that had been erected we could start work. 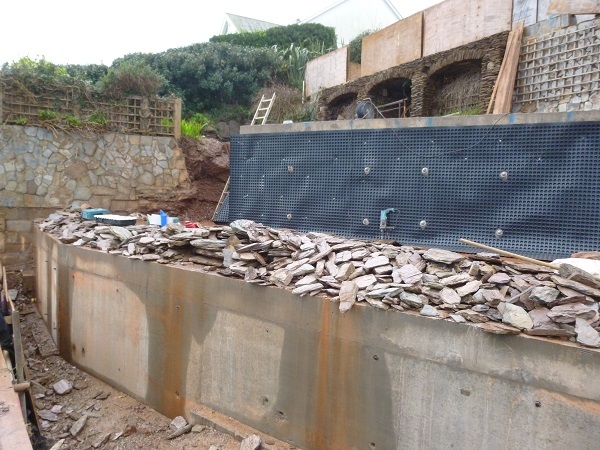 Again, the damp proof membrane was fixed to the concrete and the stonework set out. 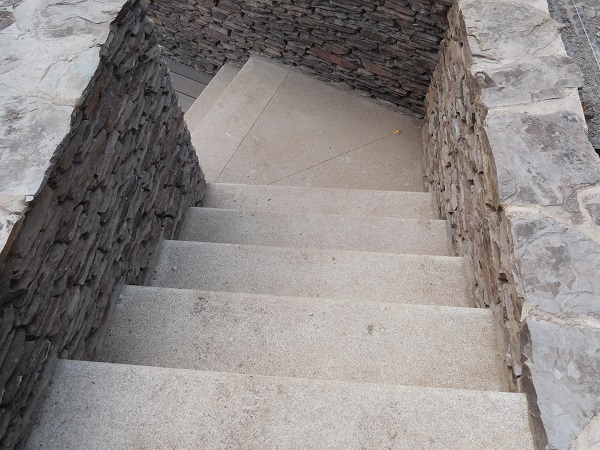 This lower wall was not as high as the upper wall, and before long this was brought up to height and built over the concrete steps that would lead you down to yet another level. 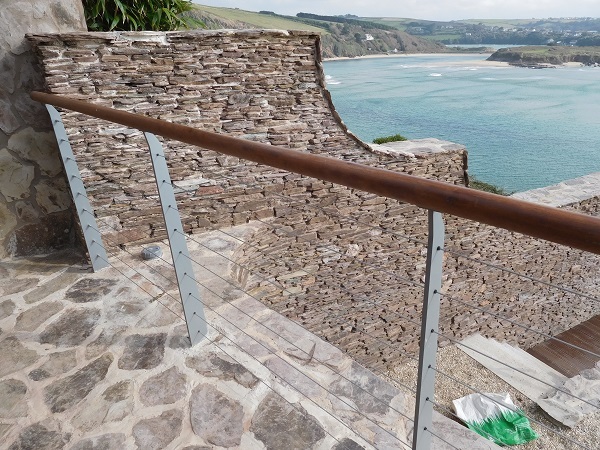 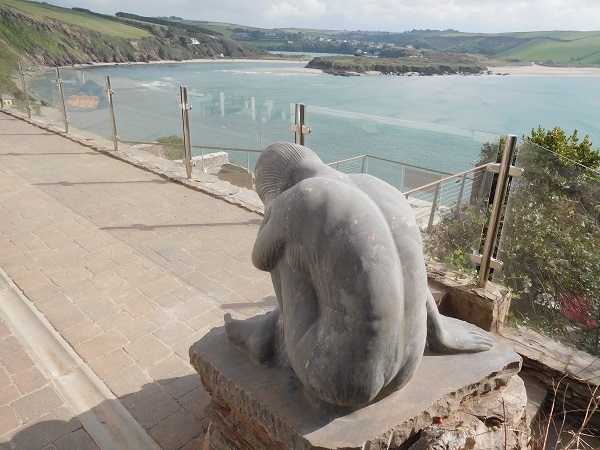 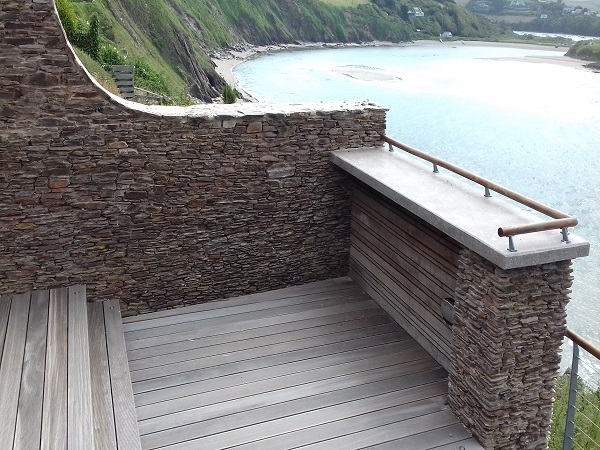 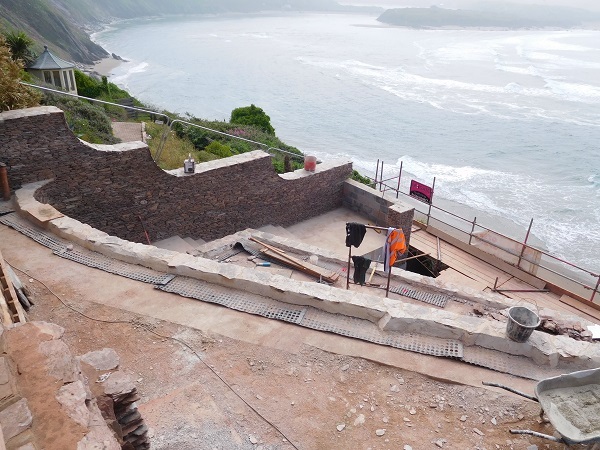 On the opposite side of the steps the stonework was built up against the concrete and this would eventually be a bar area overlooking the cliff. 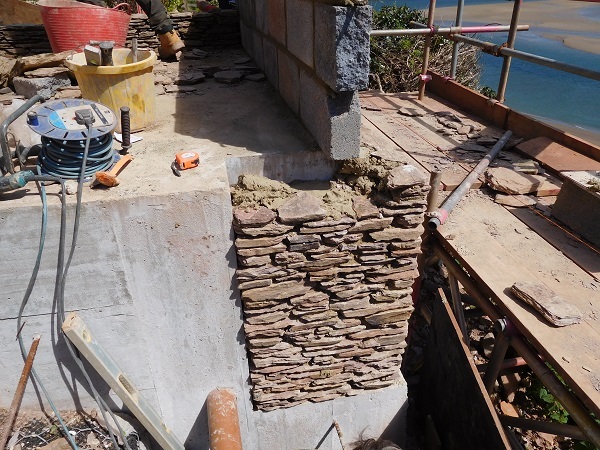 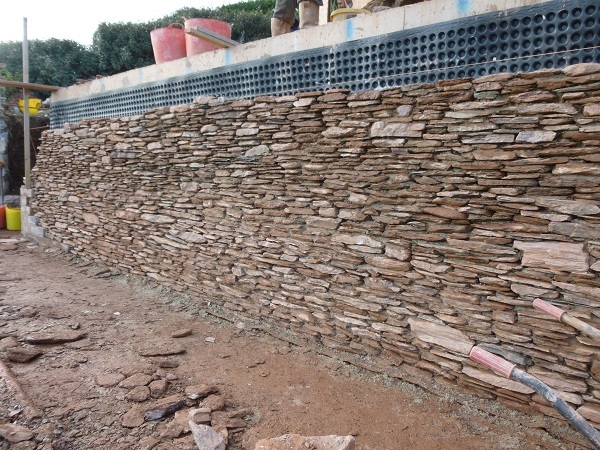 All the stonework built against the concrete retaining walls was set out at a thickness of 250mm. 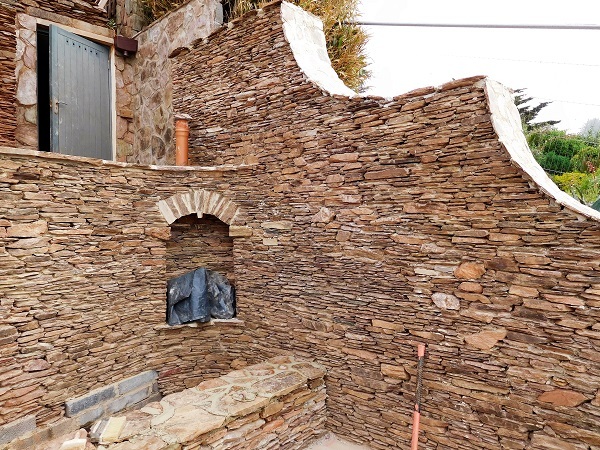 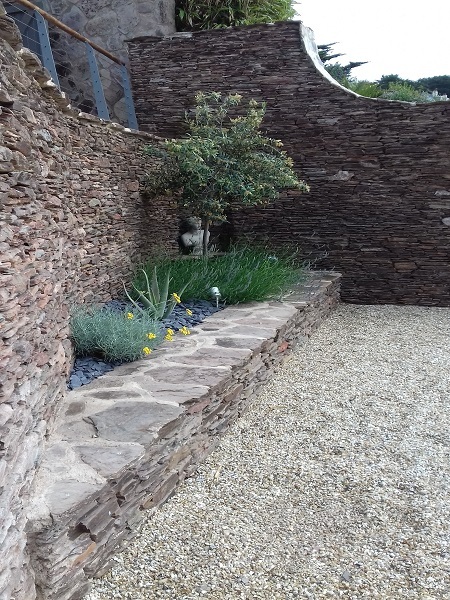 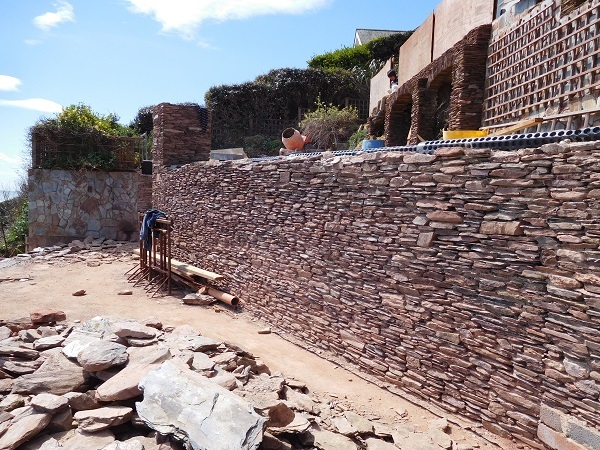 The stonework here formed the corner of the garden and once the bar area had been built up over the concrete, we started work on the new boundary wall between the two properties. 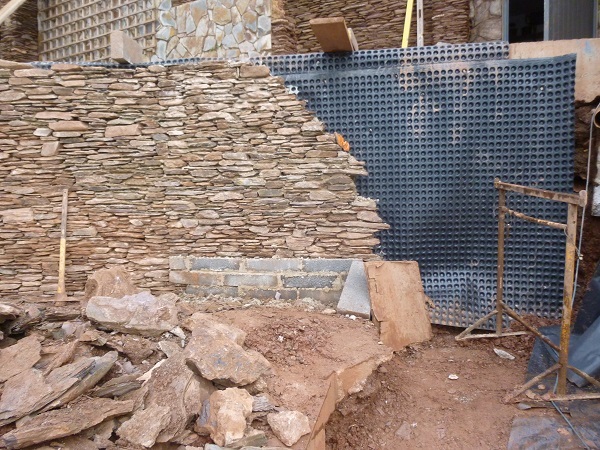 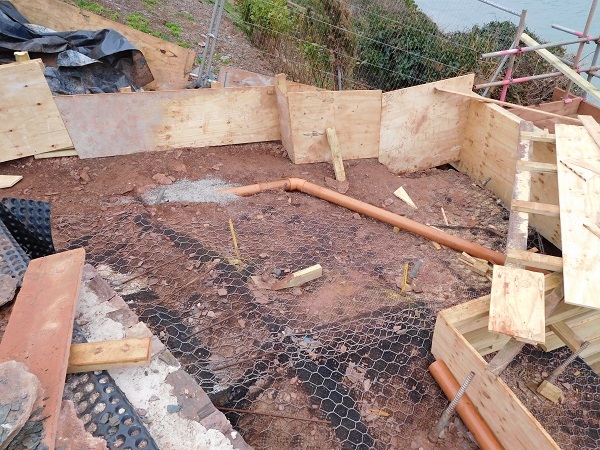 The boundary wall was double faced and this was set out at a thickness of 500mm. 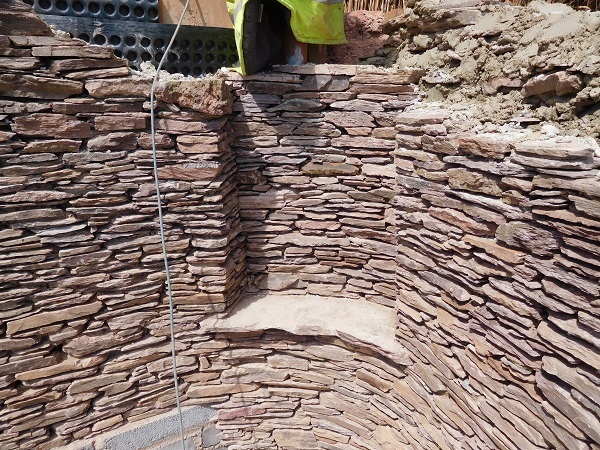 We still had to tie the first wall we had built into the new boundary wall and this was swept around in a radius to meet it, we also formed another arched niche in this curved section which was similar to the previous one we had constructed. 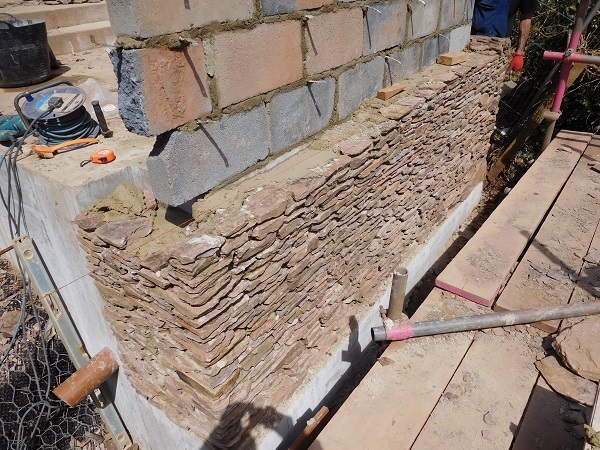 This also had a slate sill. 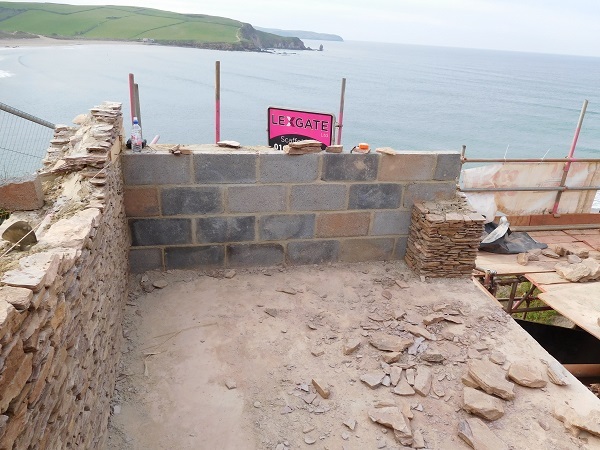 As the boundary wall got built away from the bar area and back to the property, the higher it went. 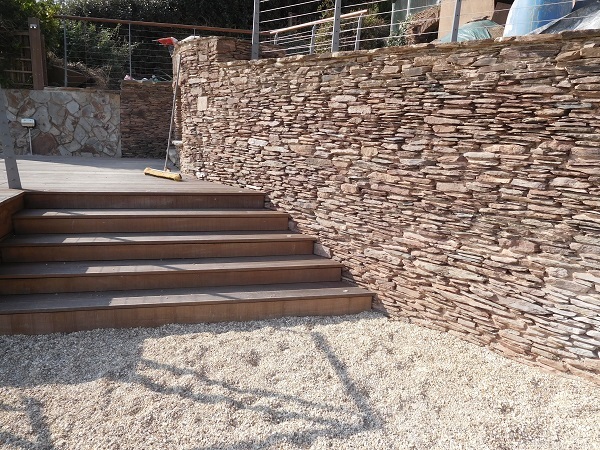 It was stepped back with curved scallops and then capped off with natural stone. 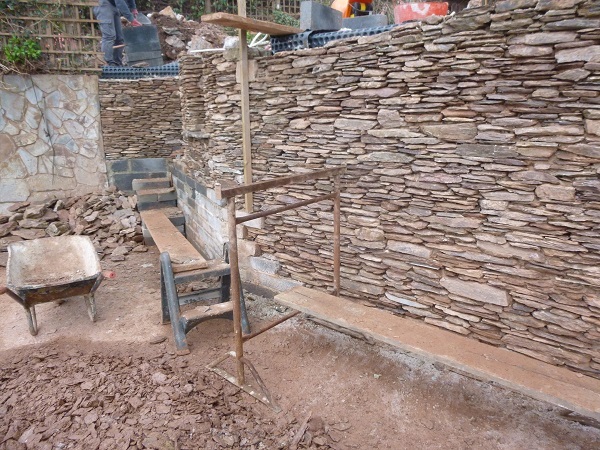 We also built a small dwarf wall which formed a raised planter. 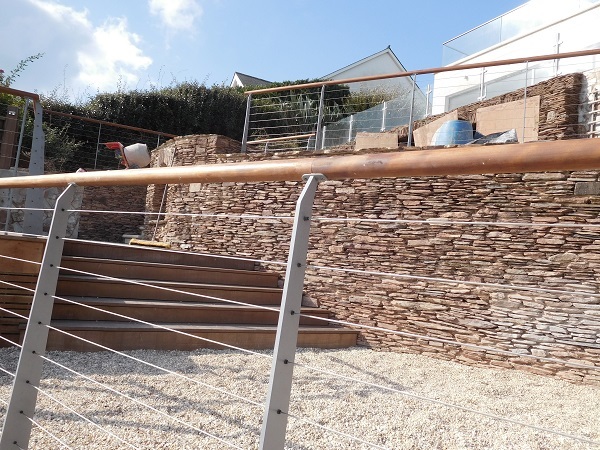 From the property the terracing accommodated five different levels. 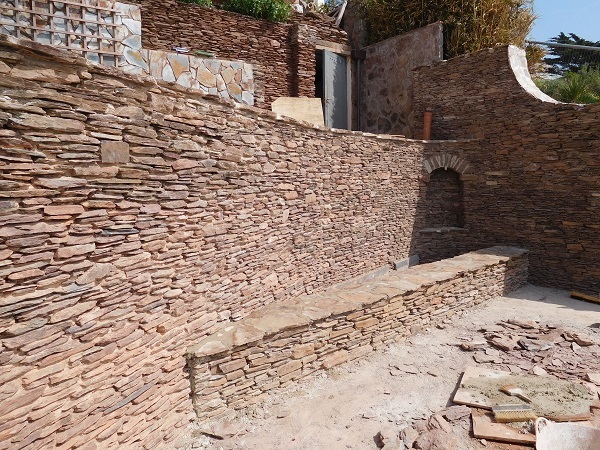 The rest of the walls were also capped off with natural slate, and we were more or less finished. 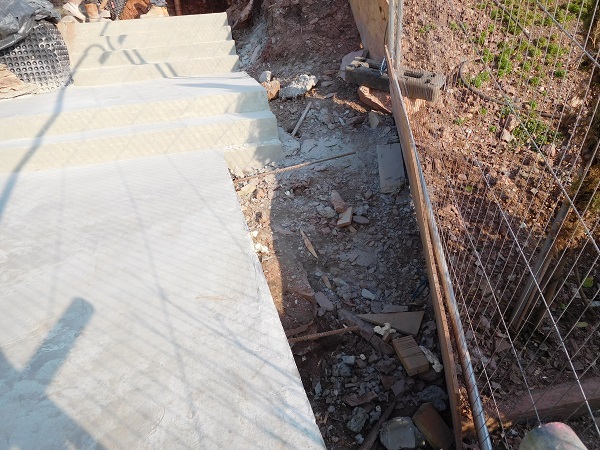 K & J Construction, the main contractors, could now carry on with tidying up the site and concentrate on finishing the final installations. 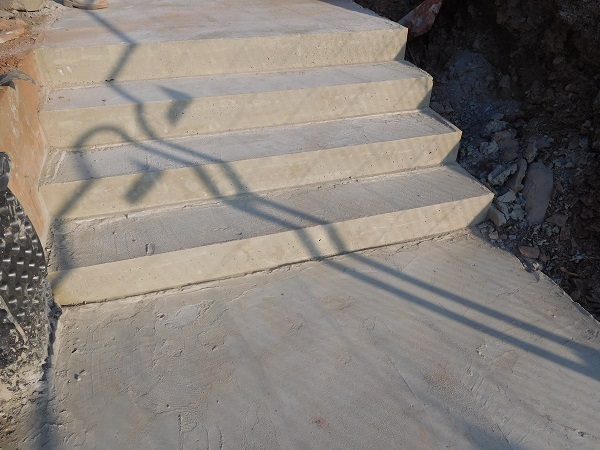 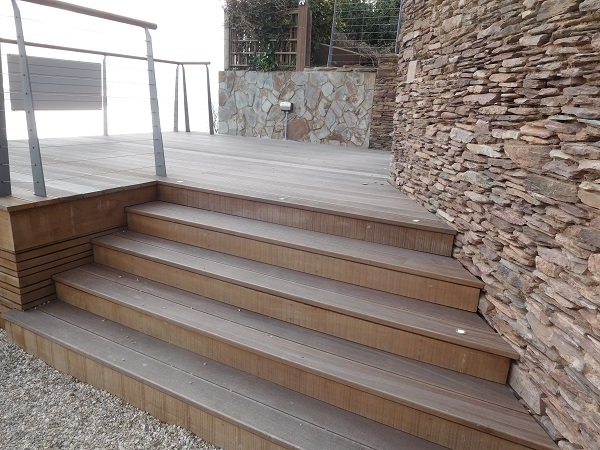 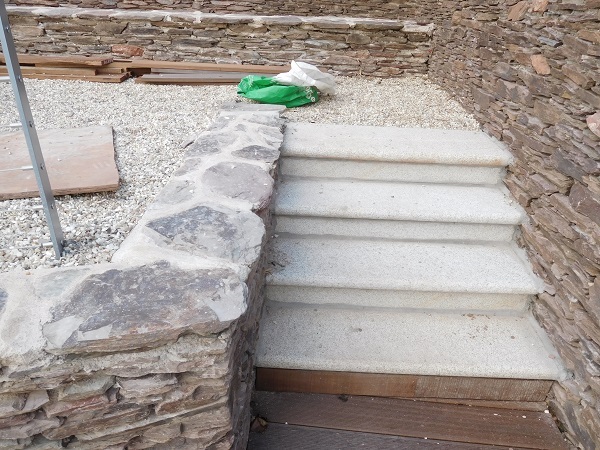 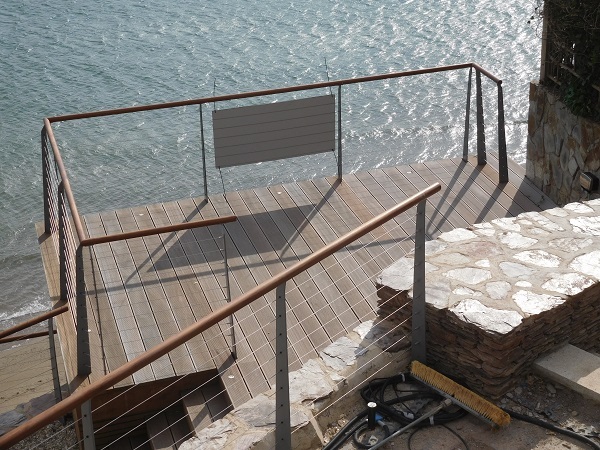 The final installations included finishing off the steps with sandstone. 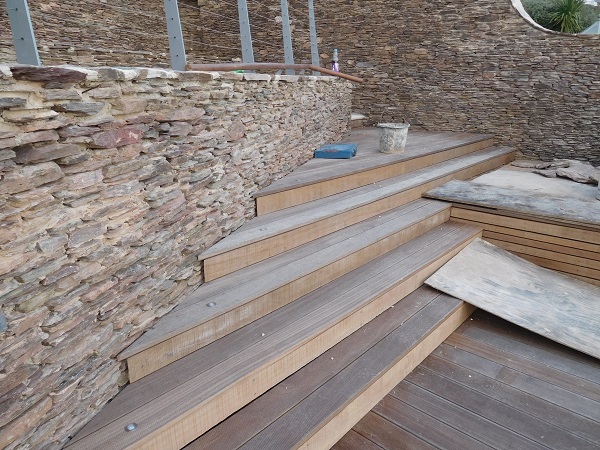 Other steps and areas were decked out with hardwood. 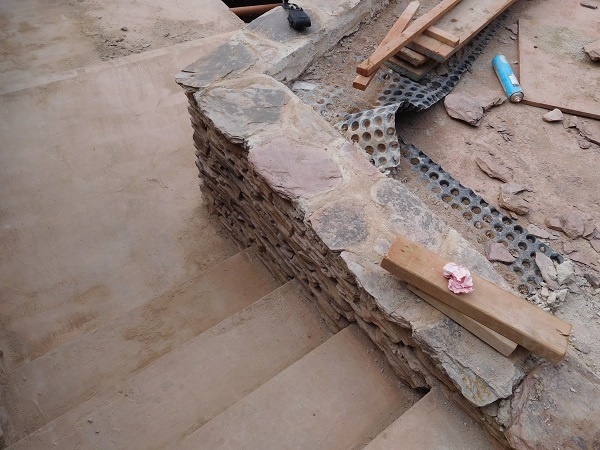 And gravel was laid down between the terraces. 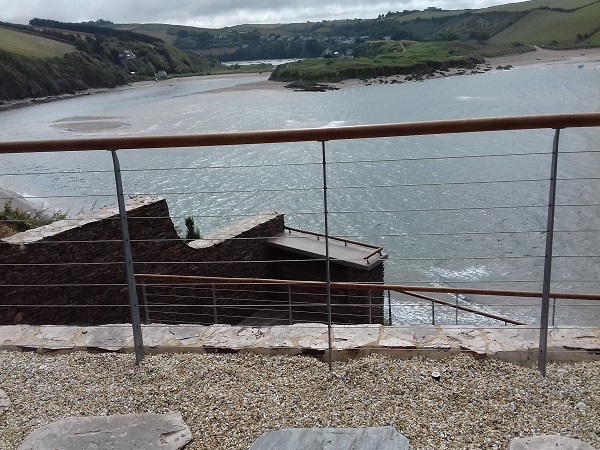 Railings were fixed to the tops of the terrace walls. 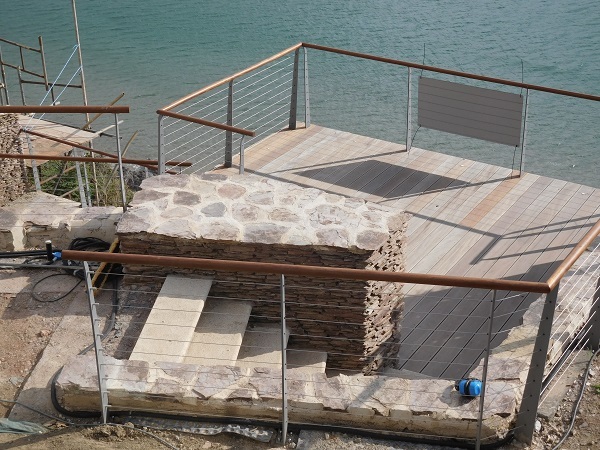 The bar top was made from polished concrete. 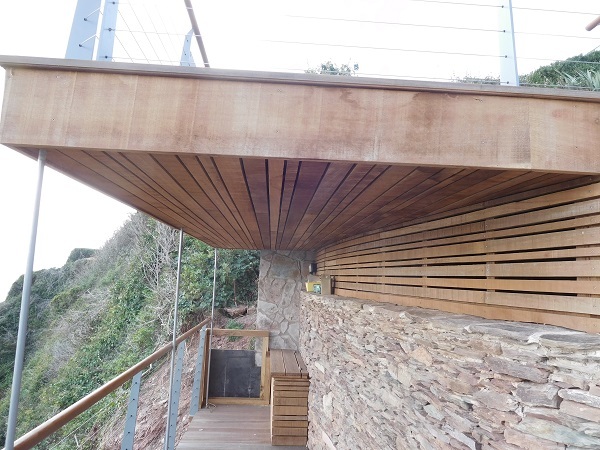 Part of the terrace cantilevered out over the lower levels. 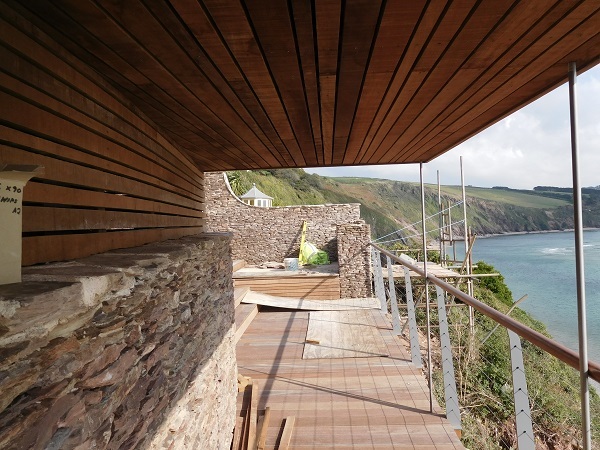 As challenging as this job was, when completed it was time to sit down, relax and take in the views.